The first round of Go4IT produced four awards – one of which was to Vision North Somerset. We were delighted to present Vision North Somerset with two laptops, two printers and mobile WiFi to help set up their home visiting service that is designed to help users with visual impairment to get information and support on welfare benefits. Vision North Somerset is a registered charity supporting 1,600 blind and partially sighted people in the North Somerset area. The service helps users to remain independent by offering practical and emotional support. It also provides the equipment service for deaf and hard of hearing people on behalf of North Somerset Council. Some of the activities that are providing by Vision North Somerset include social clubs, a befriending service and helps people claim the benefits that they are entitled to. 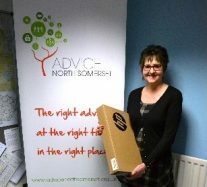 Vision North Somerset intends to use the mobile IT equipment and WiFi to launch a home visiting scheme in North Somerset. This will enable users who may struggle to travel outside of their homes to have the support needed with claiming benefits online. This new scheme is particularly important as it provides direct support to a potentially digitally excluded user group.